A former reality TV show contestant has been jailed after he was found guilty of assaulting a boy with a golf club. 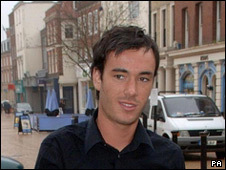 Jack Tweed, 21, of Buckhurst Hill, Essex, was on Channel 4's Celebrity Big Brother with girlfriend Jade Goody. He received an 18-month term at Chelmsford Crown Court for attacking Daniel Steele, now 18, in 2006. Mitigating, Andre de Moller told the court Tweed was living with Ms Goody, who needs an operation for "advanced and life threatening" cervical cancer. He added that the 27-year-old, who had not given evidence, "has a long road ahead of pain and distress". Co-defendant James Mattock, 29, who also denied assault, was also given an 18-month term. Recorder Mark Lucraft QC, said both men would spend nine months in prison before being released on licence. Prosecutors suggested that the two men had been "teaching a lesson" to the teenager. The court was told that Tweed had been the subject of abuse from local youths and had been involved in an altercation with a group of teenagers, including Mr Steele, shortly before the attack. The judge said the attack had left Mr Steele with bruising to his head, face and chest. "It was a frightening scene and a traumatic experience," he said. "You went, it seems to me, with one purpose - to attack and to have a fight. "Hitting someone about the head with a weapon is an extremely dangerous thing to do."